As many of you know by now, LOYAL3 is shutting down effective May 22, 2017. This means that account holders need to decide what to do with the assets in their accounts well before that time. One option is to take no action and let the shares of stock and available cash transfer into a new FolioFirst account. Based on monthly fees ($5 maintenance fee starting in August 2017), my wife and I have decided against that option for our assets. We could also decide to sell all our shares in our LOYAL3 account and transfer out the cash. Since we are building our portfolio … we are not interested in selling our shares. The last option is to transfer all of our whole shares of stock to another broker – in our case Fidelity. This is the option that we are choosing and actually just turned in the paperwork this morning for the transfer. Note – partial shares cannot be transferred … which is why we needed to analyze our LOYAL3 holdings and make a plan.. This is actually the first time we have ever transferred stock from one broker to another. I have been wanting to transfer some shares held in our ComputerShare account to avoid fees … but haven’t done so yet. Maybe this will push me towards taking that leap. Anyways … we put the transfer in this morning and only needed 2 documents to complete the process. First we needed a recent statement from LOYAL3 showing that I was the account holder, etc. Next we needed to download and fill out a Transfer Assets to Fidelity form which was quick and easy to fill out. We were able to scan the filled out form and upload it back to complete the process. The whole process took about 10 minutes to complete. Not as much work as I had originally thought. What took more time was deciding on how to sell off partial shares of some stocks at LOYAL3 while buying more shares of other companies to get to the next whole share. Selling off partial shares of stock at LOYAL3 was actually very simple. Note – shares marked with an * represent selling our entire holding (KHC, K, VFC, and DPS). Why did we decide to sell off these partial shares instead of letting LOYAL3 do it? Because we wanted to use the funds to buy more shares in other stocks to get more whole shares in those companies. But … that still didn’t leave us with all whole shares. So in our final step we had to sell the following shares. The end result was a cash balance of $12.60. Does it seems like a bunch of work that may not have been necessary? Possibly … but based on our goals we wanted to increase our shares in a few accounts before the transfer. One of the downsides of LOYAL3 was that they required account holders to invest in whole dollar amounts over $10. So instead of just buying 7.6794 shares of Best Buy to get to a whole number, we needed to invest $350 (6.9541 shares), then invest another $40 (.7802) shares, and then sell .0418 shares to get to 10 whole shares. It was a tough decision, but we decided to cash out entirely of a few stocks including VFC Corp (VFC), Kraft Heinz (KHC), Dr Pepper Snapple (DPS), and Kellogg (K). We owned so few shares in these companies and didn’t think we would be actively buying shares in them … especially if we pay commission. From the list of shares that are transferring – Target (TGT), Intel (INTC), and McDonald’s (MCD) will be combined with existing shares in our Fidelity account. One last thing … we will be setting up direct reinvestment plans (DRiP) on all of these companies in our Fidelity account once the transfer is complete. We look forward to slowly building these positions again through dividend reinvestment. 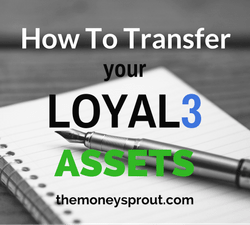 How are you handling your LOYAL3 assets? Are you considering using FolioFirst or planning to transfer to a new broker?